The Zoo is pleased to announce the safe transport of its male giraffe, Tafari, to his new home at Zoo Boise, Idaho. 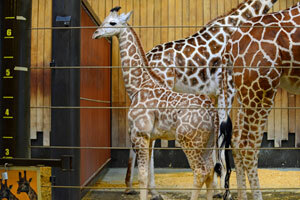 Two-year-old Tafari was moved from MCZ on Sept. 15 in a specialized trailer that allows the height to be adjusted for the particular giraffe being transported. The trailer is still able to drive safely under all of the overpasses as it travels on interstate highways. Tafari was born Sept. 16, 2015 at the Milwaukee County Zoo to parents Ziggy and Bahatika. He was named through online voting; visitors chose the name which is an African word meaning “he who inspires awe.” He became a fan favorite at MCZ, as the public was able to watch him grow and become a young member of the herd. At Zoo Boise, Tafari will be on exhibit with another male giraffe who is 7 years old.